Abimis places great attention on every single detail in the production of unique, customisable designer kitchens. 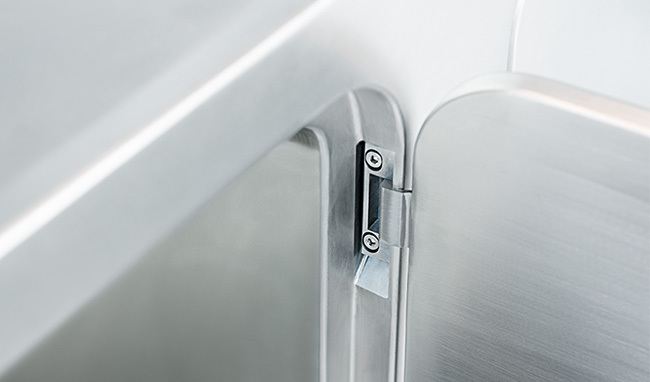 Abimis stays constantly up-to-date with the latest innovations, and it has studied and patented the Ego hinging pivot, which allows unique luxury kitchens to be designed with flush-fit doors. The Ego hinging pivot, which is made of stainless steel, does not require constant adjustment and it is also extremely easy to clean. Also in the case of traditional hinges, Abimis implements quality products for guaranteed durability. 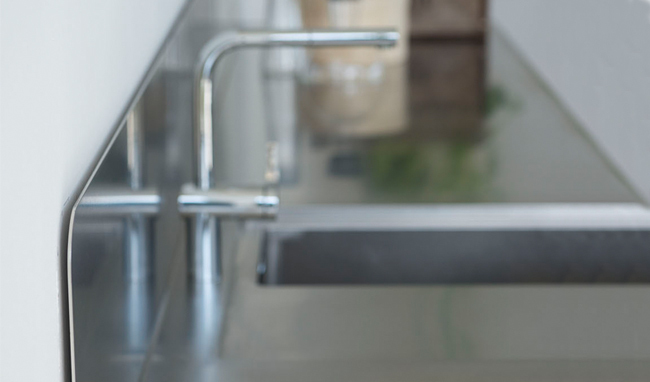 The stainless steel worktops and doors in Abimis designer kitchens are reinforced using honeycomb aluminium panels to ensure maximum sturdiness in the domestic kitchen. The luxury kitchen proposed by Abimis has its structure entirely made of AISI 304 stainless steel, which is a recyclable material that does not deteriorate. Abimis designer kitchens are entirely customisable because they are built around the customer’s needs and requirements. Indeed, the company offers customers the opportunity to design and build the worktop backsplash of any size to guarantee maximum cleanliness. In addition, the customisable worktop backsplash ensures maximum freedom of expression to configure everyday life settings in the best possible way. With its stainless steel designer kitchens, Abimis puts great emphasis on one of the most fundamental components of a kitchen, i.e. hygiene. 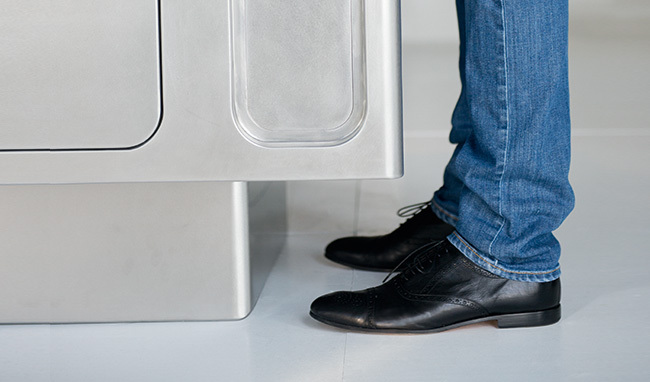 For this reason, the brand offers an innovative refrigerated kitchen bin, devised specifically to neutralise unpleasant odours and reduce the spreading of bacteria, enemies of hygiene, especially in humid waste. 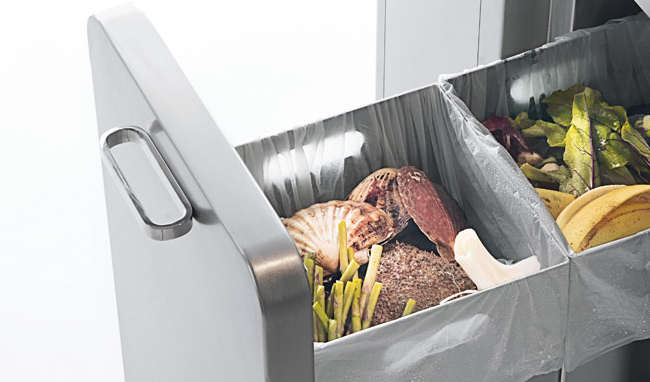 Abimis kitchens are designed to accommodate the refrigerated bin. 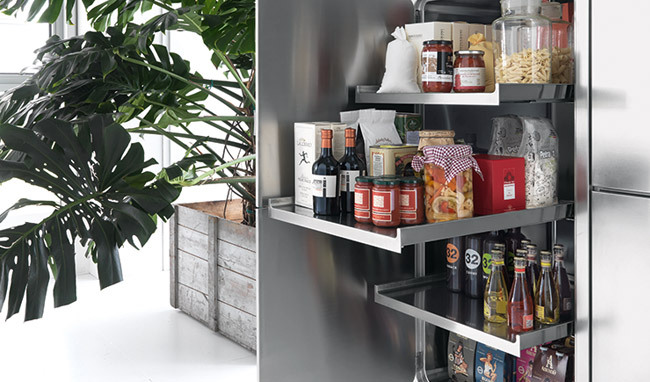 The shelves in Abimis kitchen modules can be pulled all the way out, which is a fundamental detail in any kitchen. This characteristic not only allows for the use of all the available space, but it also makes for easy cleaning. Shelves that pull out completely make it easier to reach items placed right at the back of the shelf, which are harder to get to. 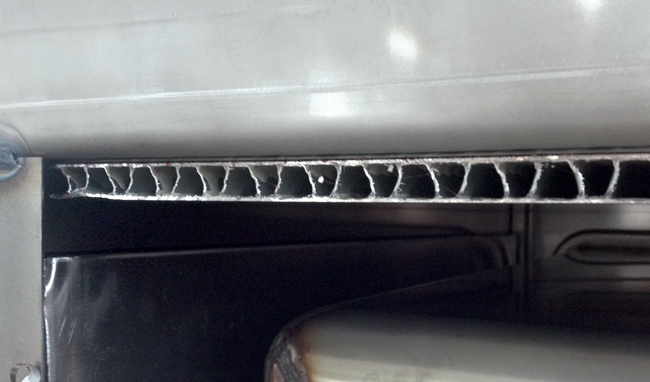 They are also fitted with a soft-closing mechanism to avoid bothersome noise. In Abimis kitchens, the recessed kitchen plinth (by up to 200 mm) was devised to allow feet to move more freely and grant easier access to the entire depth of the work surface. The recessed plinth proposed by Abimis is fully height-adjustable to make the entire work surface ergonomic and convenient. Abimis stainless steel sinks are custom made, according to the customer’s preferences, also to accommodate medium and large-sized pans. 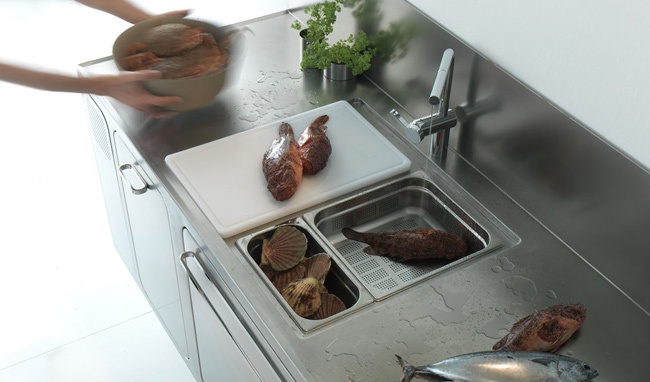 The sinks are integrated directly into the worktops for easier cleaning and to render the whole structure more uniform. In addition, the dimensions of the stainless steel sinks are compatible with the measurement parameters set by the Gastronorm system.